Ain’t no bamboo hiiigh enough! Alright, kendo fans, I know you’ve been clanking your bamboo swords together in anticipation for this one. The question that’s on your minds: does Champion Kendou accurately probe the subtle depths of the martial art? Well, for those who may not know what kendo means (like myself prior to this review), the word “kendo” means “Way of the Sword,” while the practice of kendo itself is “a Japanese form of fencing with two-handed bamboo swords, originally developed as a safe form of sword training for samurai.” Champion Kendou does throw two presumably Japanese gentlemen into an arena, complete with armor, bamboo swords, and spectators. Beyond that, your guess as to whether the SG-1000 does kendo justice is as good as mine. Like the other Champion games on the SG-1000, there are menu options you need to select prior to wielding your bamboo sword. Two of these options are in Japanese and affect how the match is fought. 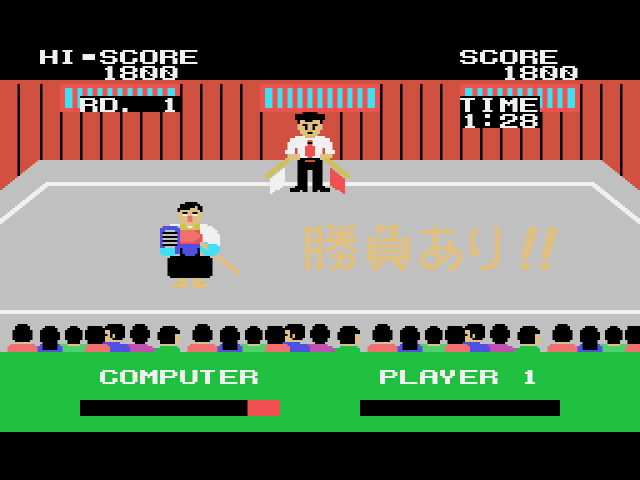 Both options place the fighters in the ring, but the second option displays a power meter underneath each fighter, while the first option shows a string of white kanji-filled dominoes underneath the fighters. To be honest, I’m not sure what the dominoes represent. I thought they might unleash specific moves once selected, so I tried scrolling through them as the characters fought with the joystick. The dominoes did not comply with my tactics, so I did the best I could, which is to say, not very good at all. There are also six levels of difficulty for you to choose on the menu screen. The higher the difficulty you select, the more you should probably know about kendo (and how to control your player) before fighting your opponent. No wonder I’m getting destroyed, my guy can’t see! To me, Champion Kendou plays like an unwieldy sword match where neither fighter really knows what they’re doing. The object seems to be to hit your opponent in a sensitive spot in order to knock them down and take down their power meter, but how one discovers this sensitive spot is a mystery. When you begin the match, your player moves of his own volition. You can guide him backwards and forwards slightly, but he never stops moving. Button 1 and Button 2 both seem to block and attack, but Button 2 has the stronger of the attacks. The longer you hold down Button 2, the greater the knock on the head to your opponent, but the more power you remove from your own power meter. The joystick also seems to correspond to the direction and nature of the blocks and attacks, but I couldn’t figure it out completely. Nor could I figure out the best time to block or hit. Each button press on my end was a guessing game, in hopes that I could get beyond Round 1. Champion Kendou might be a good game for those willing to wrestle with its supposed intricacies, but given Sega’s track record with these Champion titles, I’m willing to bet the game is average at best. Champion Kendou has strange, clunky controls, and unless you’re a kendo disciple, I’m not sure why you would bother. But like the mahjong or tsumeshogi games I’ve tackled already, Champion Kendou was never released outside of Japan, and thus, wasn’t meant for a honky such as myself. 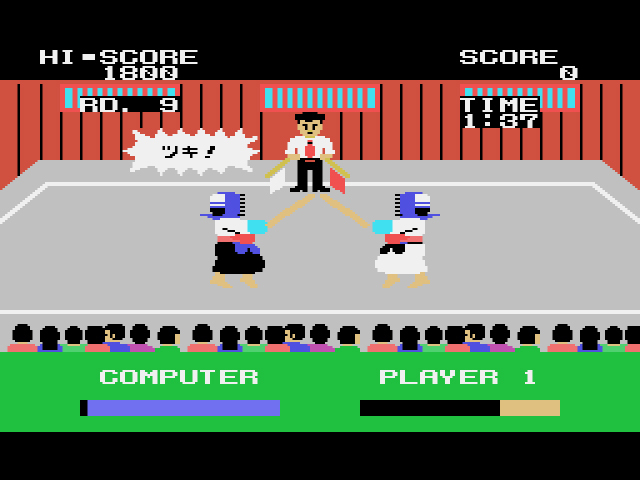 Perhaps in 1986, this game was a revelation for kendo fans. If indeed this was the case, who am I to tell them they’re wrong? Nah, I just listened to the inappropriately jaunty “fight” music included. But now that you mention it, the MK theme song may just give this game some weight. Yeah, this is worlds away from Kendo Rage for the Super NES.